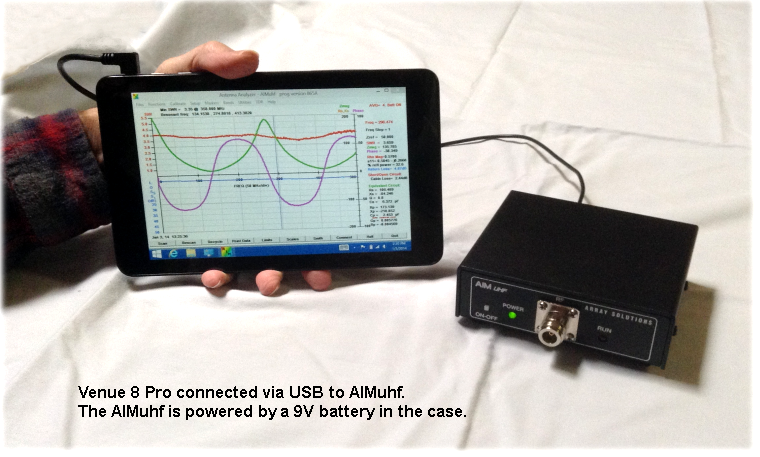 For several years we have had requests for a handheld antenna analyzer equivalent to the AIM4170. Until recently the handheld format required a sacrifice in performance and a rather high cost. Now technology for the tablet computer has improved to the point where a full-featured handheld analyzer can be obtained at a reasonable cost. The new tablets work with both the AIM4170 family and the VNA2180 family. The new tablet computers running Windows 8.1 make it possible to have a handheld antenna analyzer with all the features of a desktop computer. These tablets have the complete version of Win 8.1, the same version that runs on desktop or laptop computers. The same AIM or VNA program can be downloaded and the touch screen can be used without a keyboard or mouse to operate the AIM4170, AIMuhf, PowerAIM, VNA2180 or the VNAuhf. Members of the AIM family with one port need only an extension cable of two or three feet to extend the RF port to a convenient point for making connection to the antenna or component under test. This cable is included in the calibration process so it's length, impedance and loss are not important. All these parameters are compensated by the calibration data. The AIM itself can be carried in a backpack or totebag with tools and accessories, so it's out of the way. The tablet itself can be conveniently carried in a coat pocket or large pants pocket for easy access. The screen of the tablet I'm featuring in this report has 1280x800 pixels, so the graph and data have good resolution. Scan data can be saved in files and transfered to another computer via the wifi link, email or flash drive. Screen shots can be saved with the Snipping Tool included in Windows. Everything operates the same way that it would on a big computer. The Dell Venue 8 Pro is available for less than $300. The Microcenter computer store (microcenter.com) has them for $200 for in-store pickup. In January, 2014 Amazon.com has them for $250 with free shipping. The model I have has 32GB of memory. Another model has 64GB of memory. Note that Dell also has a model called the "Venue 8" (without the Pro) which uses the android OS. This is probably a very nice tablet but it won't run the AIM program. The software includes Microsoft Office too. All the software is preloaded so there is no CD to worry about. For the initial setup, I found a keyboard and mouse were convenient but they aren't required. These accessories can be connected to the USB port with a simple USB expander and for about $15 in accessories, I have a complete computer. The keyboard, mouse and AIM can all be attached to the USB port at the same time. For portable operation in the field, only the AIM connection is needed. When you get the Venue 8 Pro, be sure to get a USB/OTG adapter to connect the microUSB port on the tablet to external devices. This is about $3 and can be found at the computer store or on eBay. A nice case can be found on ebay or Amazon for around $15-$25. For models of the AIM family that need a USB/RS232 adapter, I have evaluated a model that I got on ebay from earthpeopletechnology for $8.00 including shipping; look for the FTDI designation. It installed itself automatically on the tablet running Win 8.1. The adapter has blue LED's that blink when there is buss activity. The I/O port was assigned to comm 3. After going though the initial setup of the computer, the connection to my wifi link was very easy. Windows found the link immediately and I just entered the password. Similarly for the AIMuhf, it recognized the new hardware and found the driver on the internet automatically. The comm port was assigned to comm 3 and when I entered this into the AIM program, the AIM worked just like it does on my main computer. The buttons and menus can be operated by the touch screen so you don't have to use a mouse or keyboard for field work. The battery in the Venue 8 Pro will last about eight hours. It recovers from the sleep mode instantly. If you want to turn the tablet off to save power, it will reboot in about ten seconds. The display is readable even in bright sunlight. The tablet and your big computer can use the same AIM/VNA programs and the same calibration files. Scan files can also be transfered between the computers. While in the field, it's very nice to have all the computing power you are used to for processing data and for communicating with other people through Skype, or email. A user of the VNA2180 has reported very good results with an Acer Iconia W3 8 inch tablet. It also features Windows 8.1 and Microsoft Office. Here is a comparison between the Dell Venue 8 Pro and the Acer W3. The Dell is a little faster although that probably won't make a difference when controlling the AIM or VNA. The Dell is also a little smaller and much lighter in weight so these factors might be consider for portability. Note: There is a Microsoft tablet called the "Surface RT". This has a special operating system and not the real Win 8.1, so it can't be used for the AIM. The regular Microsoft Surface computer with Win 8 will probably work but it's much more expensive. I have only evaluated the Dell Venue 8 Pro; there may be other tablets that offer comparable features and performance. 2. Required - USB/OTG adapter is required to convert from the microUSB connector on the Venue 8 Pro to the AIM cable or other accessories. These are around three dollars on ebay. Search for "usb otg". I like the right angle model mayself. If you're using an AIM or VNA now, the same cable that you have connected to your big computer will plug into this adapter and you're ready to go. 3. Optional but highly recommended - Stylus. Inexpensive stylus shown on ebay for three or four dollars for a pack of ten are good. The stylus makes it much easier to select items on the screen and it even works when you're wearing gloves. Note: the Dell stylus for about $30 has received consistently bad reviews through 2013. I did not get this option. 4. Optional but recommended - Carrying case. The Venue 8 Pro has a textured back cover and it's easy to hold but a cover makes it even easier to hold and provides good protection. Nice carrying cases can be found on Amazon.com or ebay for less than twenty-five dollars. 5. Optional - USB or Bluetooth keyboard and mouse. Nice for office work. Not required in the field. I got a keyboard and mouse combo package at the Microcenter for $7. This is the Inland brand and the keys feel good. 6. Optional - USB expansion port. This is a simple port extender, no extra power is required for most accessories. This is needed if you're using a USB keyboard and mouse. It is not needed for the AIM by itself. These are about six to eight dollars. The 8 inch tablet is compact enough to be held with one hand, yet it packs the same computing power as a desktop computer. This model is compatible with Windows programs and comes complete with Microsoft Office. When traveling light, this can take the place of a laptop. May, 2015: HP has a 7 inch tablet called the Stream 7 for around $100 (or less) that has been found to run Win 8.1 quite well. Many of the small tablets use a single USB port for charging and for communication but not at the same time. The battery life is good, so a fully charged tablet will be able to operate for several hours in the field. If you want to charge and operate the AIM at the same time, it is possible to use an external circuit to combine the charger and the cable to the PC. I have not tried this myself but this circuit has worked for some people. Other circuits may be found on You Tube. For convenience, I calibrated the AIMuhf with an LMR200 cable three feet long. This extends the RF test port a few feet so it is easily accessible when the AIMuhf black box is tucked away in my tote bag. The cable does not have to be a low loss type, since the calibration takes care of imperfections in the cable and connectors. For these examples, I put a 9V alkaline battery inside the AIMuhf case. This will run for a few hours. For extended work, a rechargable battery is nice. Some people have mounted the battery on the outside of the AIM case for convenience. Then it plugs into the same socket where the wall power supply is usually connected. The DC voltage required is 7V to 14V. The current is less than 400 ma while scanning and about 40 ma while idle. If the battery operation mode is selected, the power will turn off automatically after being idle for ten minutes. 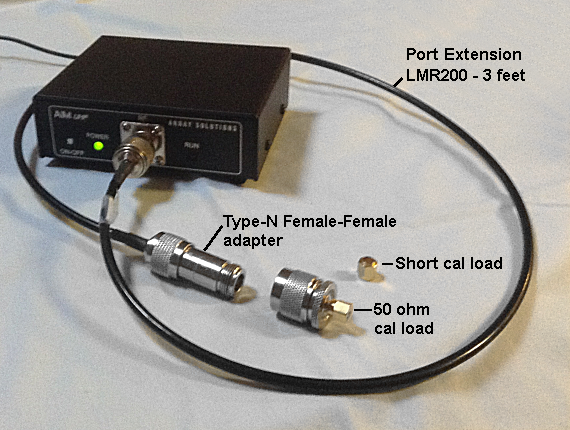 This picture shows the LMR200 extension cable. The cable has male connectors on each end so a female-female adapter is used to make the extension cable compatible with the RF connector on the front panel of the AIMuhf. The type-N cal loads normally used for the AIMuhf are shown. The same principle can be used for the AIM4170 and the PowerAIM with BNC or UHF cal loads. 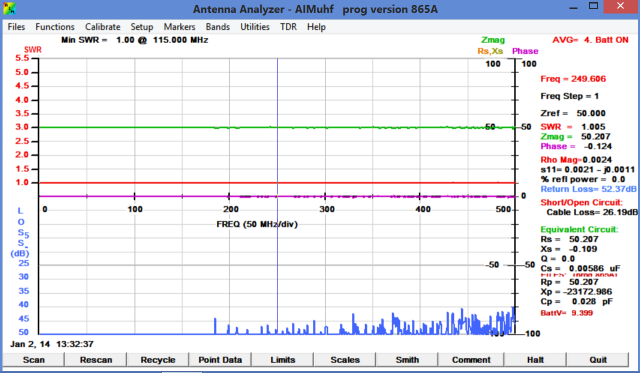 After doing the Standard Calibration, I did a scan of the 50 ohm cal resistor up to 500 MHz. The size of the graph and the font can be adjusting by setting the width and height parameters in the config file. // the full screen size will be use. // The earlier versions of the AIM program used a max graph size of 950 x 600. 7 // Default font size. 5 is very small, 6 and 7 are medium, 8 is large. 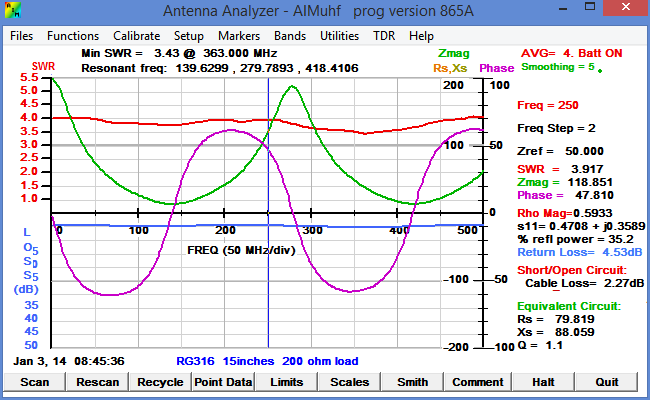 This is a scan of a test cable consisting of 15 inches (38 cm) of RG316 terminated with a 200 ohm chip resistor. 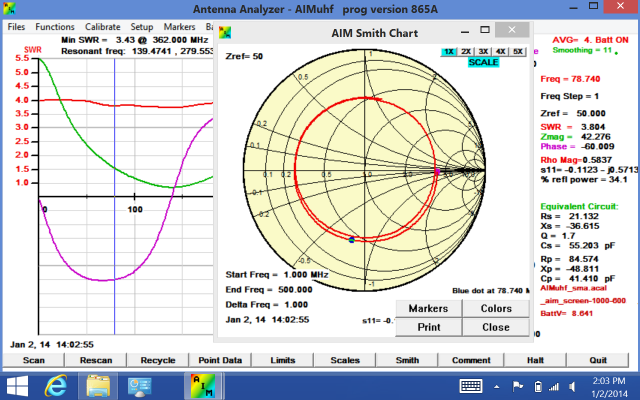 This Smith chart is for the previous scan of the RG316 cable terminated with 200 ohms. This is a full screen capture that shows some of the Windows icons along the bottom.